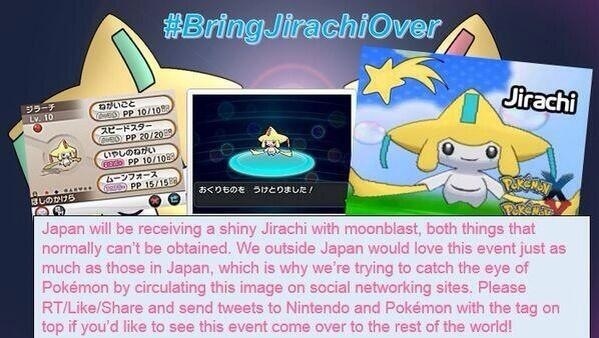 Currently, there's a soon-to-be trending topic circulating involving fans hashtagging #BringJirachiOver in hopes of America and other areas around the world also getting the shiny moonblast Jirachi, that will be given out to residence in Japan due to the Tanabata festival. Thus being said, I think if you've got Twitter, Facebook, Instagram, whatever, you should try and tweet this at least once. This event would be awesome to have, and it'd be great if we actually got more events for once. Even if we have to wait for the Vivillion distribution to end and probably past when they get it, I think a lot of people would definitely be happy over this sort of event if they got it. Just thought I'd spread the word granted they'll be cloned like crazy, but I'd rather not have a cloned version.